What Happens To Online Sales When A Store Closes? The popular argument out there is that when the customer is brand-loyal, you can close a store and the customer will simply "shop online". Those who analyze historical store closures learn something different. They learn that "some" sales move online. Some. If you manage a "brand" that has a strong online presence, you can make up retail sales (to some extent) via your online channel. 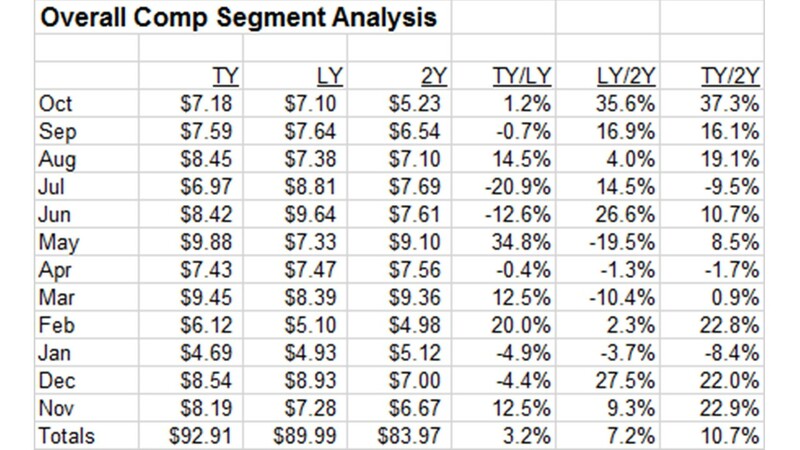 Look at the annual rebuy rates of retail-only segments ... down about 35% year-over-year. With a strong online presence, the "brand" can maintain some of the sales because customers will shift online. Now if your online penetration is less than 25% of total sales in a trade area, well, you've got yourself a veritable plethora of challenges. 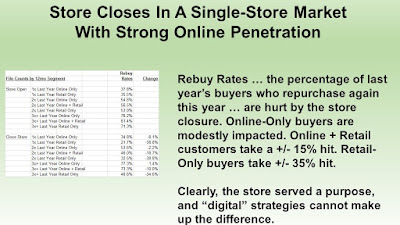 In the table above, online-only buyers are barely impacted by the store closure. Only the retail-only customers get hammered. Later this week, we'll put this information into the context of a five-year sales forecast with/without a store in the trade area. But for now, we can see that closing the store results in a decrease in customer loyalty, especially among former retail buyers ... just as we'd expect to happen. Stunt or Trend? So What? Do you remember this little ditty from a few days ago? When I talk about low cost customer acquisition strategies, this is exactly what I am talking about. Remember, last Christmas Nordstrom Rack made news for selling an $85 brick. So obviously, somebody is trying some sort of strategy to garner attention. Mainstream Media and Trade Journals need something to talk about - they only attract advertisers when they attract eyeballs, and they don't attract eyeballs by being boring. So this kind of stunt is like catnip for those folks. Many professionals (especially those who advocate emptying the company coffers for Google/Facebook) aren't fans of this marketing tactic. That's fine. But no complaints when it becomes too expensive to advertise in either channel, and no complains when response falls off in either channel. You made your bed. Here's another thing readers don't like. When I suggest that this requires a Marketing / Merchandising partnership, I get the eye rolls. "Merchants don't let us do anything, they're stupid and bossy and they think we are idiots." Try making a merchant look good, and you'll be surprised how they respond to you. Modern marketers spend more time with vendors than they spend with merchants. It wasn't always like that. Google and Facebook have been using us for a decade. And Amazon / Echo are about to judge how you look (click here). How are we going to compete against a device that tells us we look terrible and then ships us an alternative outfit within one to forty-eight hours while simultaneously generating traffic that Google / Facebook re-directs to their preferred partners? We need to work hard on developing low-cost / no-cost customer acquisition programs. I know you don't want to hear this, and I know many of you disagree. How is your current strategy working for you? If you ever want to get the blood flowing, sit down in a meeting with your Real Estate Team and your Finance Team and a handful of Executives looking to either open a new store or close an existing store. Do you remember that scene in Moneyball when the scouts are all talking about the intangibles regarding a potential player and the Brad Pitt character appears to be having intestinal cramps? That's what a lot of these meetings are like. Of course nobody is spittin' tobacco juice into plastic cups. But you get the picture. A Real Estate Director thinks that Penn Square Mall has the "potential" to flourish given the changes that are happening next door at J. Jill. Somebody in Finance is completely against the mall ... "Oklahoma City is not an aspirational market" ... even though the Finance Director has never been to Oklahoma. An EVP responsible for stores doesn't want to get hit over the head by the Board of Directors for opening yet another store that never meets the sales projections authored by the Real Estate Team. The big topic in 2017 is store closures. 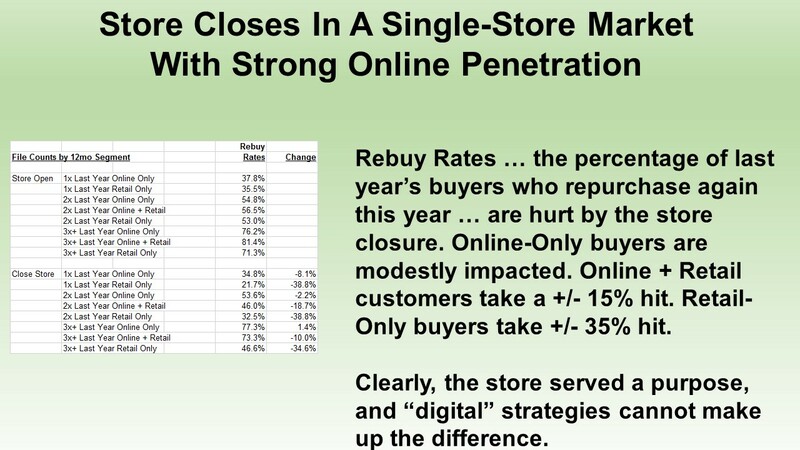 Y'all recall my omnichannel arguments of 2010 - 2014 ... arguments suggesting that store closures were the logical outcome of a strategy of creating channel sameness in an effort to compete against Amazon. Turns out the customer doesn't "demand" a one-brand approach to channels. Turns out the customer demands more from Amazon! There's no better place to apply your forecasting chops than in forecasting what happens to a trade area when a store closes. It's work that is nearly impossible to get right. Each market behaves just a bit different than a comparable market. 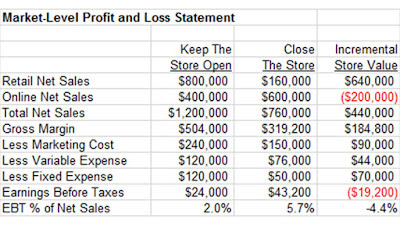 If you are off by 10% or 15%, you might close a store that is actually profitable. Next week, we'll talk about the approach I use. The approach is not fundamentally different than the approach smart catalogers used 5-10 years ago to dramatically scale back unprofitable pages to online buyers. Most important - the approach is FUN! You get to see outcomes that are uniquely different than you'd expect. And you'll be armed with the ammo to be like Brad Pitt heading into a meeting with scouts on Moneyball!! The smartest companies run five-year forecasts ... these forecasts are the sum of all business knowledge possessed by the company. You remember the "omnichannel" movement of 2011 - 2015 ... a movement that detonated in spectacular fashion with the implosion of traditional retail. How did that happen? The smartest retailers produced five-year forecasts based on the interaction of economic factors, merchandise productivity, and new + reactivated customer counts. The smartest retailers quickly figured out that the "industry" had a 1% to 2% drag on productivity, overall ... maybe due to Amazon, maybe due to shift of business online. Lots of "maybe" possibilities. The smartest retailers ran forecasts/simulations that illustrated the impact of online business on in-store sales. 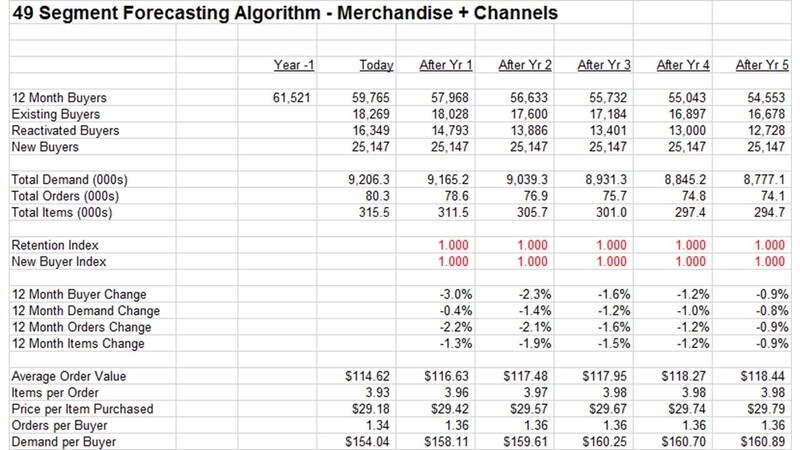 They quickly learned that retail was doing more to grow online than online was doing to grow retail ... and when forecast out over five years, the results were not favorable. 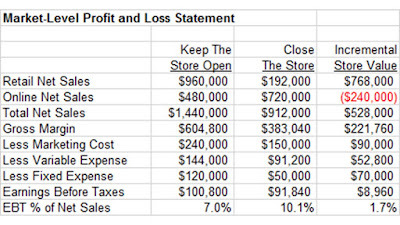 The smartest retailers passed this data on to their Real Estate and Finance Teams. Real Estate teams stopped the pursuit of new stores, and for good reason. 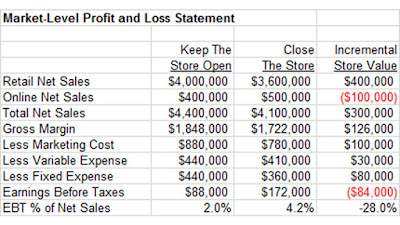 Finance Teams determined that "x" stores needed to be closed. Store closures cripple malls, further reducing foot traffic, tearing down comps among the existing stores. And here we are, today, in 2017, with a largely self-inflicted problem. Meanwhile, the "industry" begged retailers to pursue an "omnichannel" strategy at the exact time when retailers needed to figure out what the purpose of retail actually was. This led to a different set of outcomes ... "grow digital" while hoping retail would remain static, leading to overall growth and positive digital outcomes. The outcomes did not come to fruition. Online grew, retail shrunk, stores closed, retail shrunk, Amazon grew, omnichannel strategy failed (spectacularly). 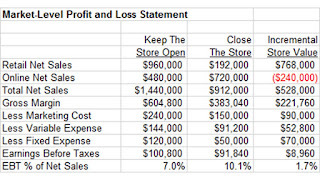 Go read the 10-K statements from leading retailers. As far back as 2014, "smart" retailers began telling Wall St. that they would begin closing stores in future years. These companies had reasonable forecasts - they could easily see the future coming. And they did something about it ... before the rest of the industry could catch up. "Forecasting outcomes are the sum of all analytics and marketing knowledge possessed by your company." If your company isn't producing five-year forecasts that accurately measure the interaction between online sales transfer from retail and store closures, you've got problems, right? If you aren't producing forecasts for the next five years, please contact me (kevinh@minethatdata.com) and we'll get busy, ok??! You recall the forecast for this business ... sales are forecast to decline. Why is this business getting smaller? 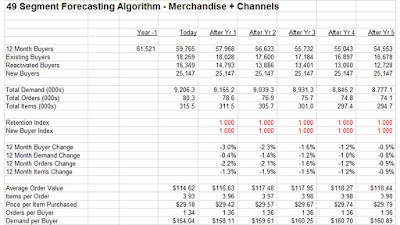 Is it Merchandise Productivity or Customer Acquisition strategy? 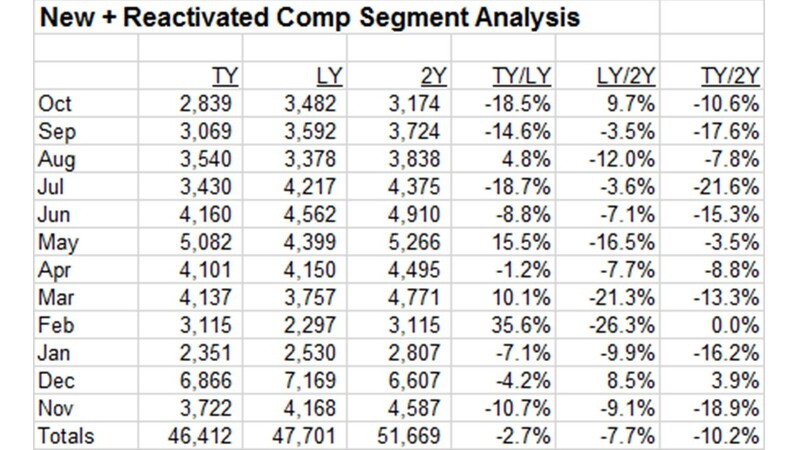 Here is my comp segment analysis ... which yields Merchandise Productivity. Tell me what you see here? On average, Merchandise Productivity is increasing. The business is getting smaller ... but Merchandise Productivity is improving. This means that the Merchandising Team is doing their job. How about New + Reactivated Customers ... the realm of the Marketer? And there you have it. 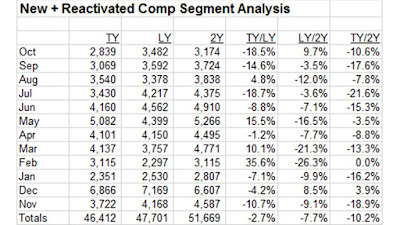 Marketing isn't doing their job ... new + reactivated comp counts are down 3% this year and are down 8% the year prior. Look at August / September / October ... Merchandise Comps are up, New + Reactivated Comps are down. This is an interesting case, isn't it? The Merchandising Team is largely doing their job ... but Marketing isn't capitalizing on the opportunity. You run these reports, right? You know how each table yields a forecast that is either good/bad, right? If not, let me help you ... kevinh@minethatdata.com. 20 Volunteers Needed To Test A Revised/New Business Simulation!!!! Show of hands ... who would like to volunteer to test their business chops? I've created a new version of the simulation performed at the VT/NH Group in March. I'm looking to take this simulation "on the road" ... to your company ... potentially holding day-long sessions to teach the simulation and to teach how Analysts might better work with Executives. The first 20 volunteers get to participate ... email me (kevinh@minethatdata.com) with your intent to participate. The competition will take place May 8 - May 12. Each morning, you (the participant) will submit your business plan to me via email. Around noon (Pacific Time), the simulation will "crunch the numbers". Each afternoon (Pacific Time), you (the participant) will learn how you are performing against your peers. The next morning, you will submit a new business plan for the following year. The participant with the highest company valuation after five years will be declared "the winner", and will earn unrelenting and unending praise from the business community. Each participant will earn a coveted MineThatData PickAxe ... how about that?! What levers will you be able to pull? Amount of Investment in Online Advertising. Amount of Investment in Offline Advertising. % of Your Merchandise Assortment That Will Be "New" Each Year. Brand-Marketing Strategy vs. Technology-Centric Strategy, Determining The Appropriate "Mix" of Both. Who wants to participate? Send me an email (kevinh@minethatdata.com) ... this should only take a few minutes of your time and you might end up being the overall winner!! Here is the evolution of rebuy rates. The evolution of file counts coupled with rebuy rates yield the following five-year forecast. The forecast isn't very positive, is it? Movement in the file happens among low-value customers. Notice, however, that there is growth among high-value customers (red in the rebuy graph). And the forecast shows that demand per buyer will increase, and average order values will increase. Clearly, this company is trying to squeeze as much out of good customers as possible. But not enough to offset weakness among lower-value segments. Recall how our customer file evolved over the past six years. There are a reasonably constant number of customers at X = -1 / Y = 0.5. These customers buy about 1.3 times a year, and only buy from the primary product category - generally buying via email marketing. There are a reasonably constant number of customers at X = -0.5 / Y = -1.2. These customers buy only one (inexpensive) item from the primary category via online. This probably isn't a segment that has a high repurchase rate. I created a GIF of repurchase rates over the past five years. 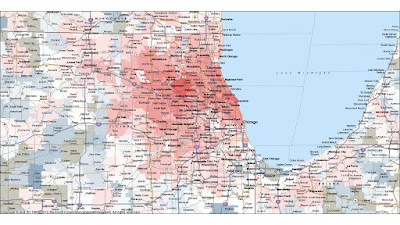 How does this GIF compare to the GIF above (if you cannot see the GIFs, please visit http://blog.minethatdata.com)? Notice that the largest file count areas have poor repurchase rates. 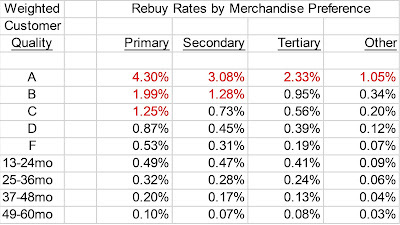 High repurchase rate cohorts are reasonably consistent over time ... customers around X = -0.25 / Y = -0.5 tend to have the highest repurchase rates. Who are these customers? They order about three times per year. 80% of their dollars come from the primary product category. Nearly all of their dollars are online - only 15% come from online marketing channels. So the most loyal customers purchase every four months ... generally buying from the most popular product category ... and they're so loyal that they don't need marketing to drive their purchases. This creates interesting challenges, when looking to the future. File growth generally comes from low-repurchase segments. We need to see if "some" of these customers will migrate to high value in the future, don't we? Let's take a look at that tomorrow. It's hard to have a good forecasting algorithm if you don't know what happened in the past. Everybody has different ways of approaching the topic. I like to use a Principal Components Analysis ... creating two "factors" ... each factor is then "segmented" into seven different classifications that yield 7*7 = 49 customer segments. By tracking the change in file counts and rebuy rates by segment, I can quickly see how a business is "evolving" ... and then I am better able to create a forecast that shows where the business is going. Let's take a look at where a business has been over the past six years. Each image below shows how the file evolved over the past six years ... red = many customers ... blue = small numbers of customers. There are two trends you should pay attention to. Lower-Right corner changes in file counts. Upper-Right corner changes in file counts. In the lower-right corner of the image, counts have been on the decline over time ... but in the past year, there is a significant increase in counts. I looked at the attributes comprising customers in this corner of the graph. What did I learn? 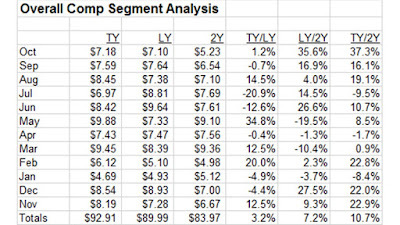 Far lower right count declines are from customers who purchased one time per year, online-only, buying product not in the primary product category for this company. Upper right corner count declines are from customers who purchased one time per year, phone-only, buying product not in the primary product category for this company. In other words, this is a company that appears to have greatly cut back on marketing of supporting product categories ... and customers simply disappeared instead of buying from the primary product category. But then something changes in the past year ... around X = 1 / Y = -0.8 we see a significant increase in customer counts. What describes this segment? Customers who buy 1.5 times per year. Their purchases are split between the primary product category and the second-most popular product category. This company changed strategy ... and is actively cross-shopping customers between the two most important product categories. On Monday, I'll share rebuy rates across time ... and if you like geeky GIFs, here is a GIF of how file counts evolved over time. There's a reason we need to forecast what happens to our business when customer acquisition tactics are not working. I shared these two facts at a recent conference ... I then asked the audience to raise hands if they spent half or more of their marketing hours focused on customer acquisition strategy? Maybe 10 of 200 hands were raised. So that's a mistake ... the vast majority of us need to spend far more time focusing on customer acquisition than on customer loyalty. Because we do the exact opposite, we sub-optimize business performance. On purpose. When you forecast what happens to your business over the course of the next five years, you know exactly what happens if you generate 59 new + reactivated buyers instead of 63 new + reactivated buyers. You know what your annual repurchase rate is, don't you? And because you know this metric, you know exactly what you have to spend your time on, regardless whether you've run a five year forecast for your business or not. An industry trade journal partnered with an omnichannel vendor to rank 100 publicly traded retailers on their ability to deliver against seven key omnichannel tactics. The index yielded perfect scores (100) and horrible scores (0). The article suggests that the customer "demands" an omnichannel experience ... strongly suggesting that a omnichannel brilliance is critical to compete against Amazon. The article did not correlate omnichannel brilliance with sales growth, profit growth, or stock price. So I correlated the index with stock price. For the retailers who are not privately held ... I calculated change in stock price year-over-year ... this borders the timeframe when the study was conducted (Q4-2016 and Q1-2017). 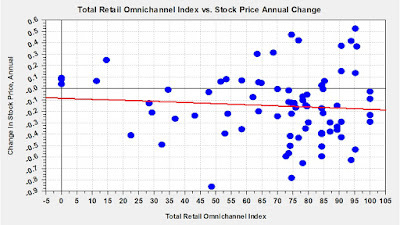 If omnichannel brilliance led to sales gains and profit gains, then we might at least be able to surmise that stock prices increased and the significant investment in omnichannel strategy yields increases in shareholder value. Right? 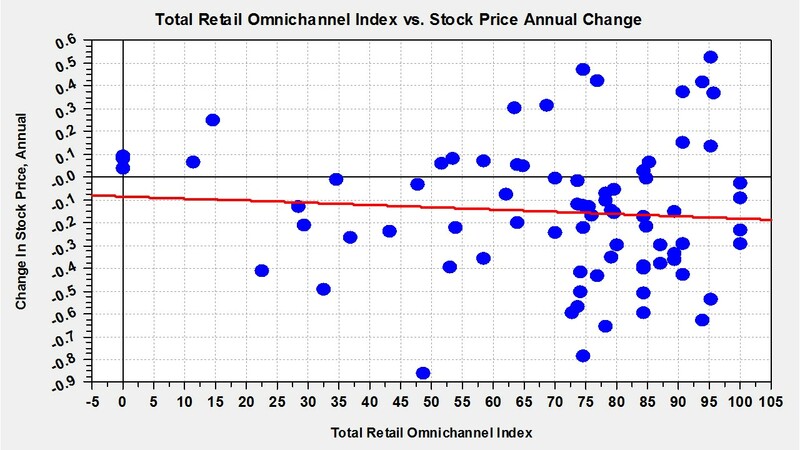 There is essentially no relationship between the omnichannel index and change in stock price, year-over-year. None. The goal here, of course, is to get you to focus on what matters most. Customer Service / Customer Satisfaction / Entertainment. We have Trade Journalists and Vendors who are demanding that you execute tactics/strategies that generate money for their businesses. Your shareholders are demanding that you execute tactics/strategies that generate money for them ... allowing you to keep your job and potentially earn raises/promotions. Please focus on the latter. We are going to spend some time discussing the future? Here's why ... when I attend a conference, professionals tell me that various tactics aren't working anymore. Especially customer acquisition tactics. "The co-ops don't work anymore, performance is down 15% per year for each of the past three years." "Our stores are not generating new customers." "Google and Facebook have become too expensive. What should I do?" "We have to cut back on marketing expense in an effort to optimize performance". "What happens to your business in 2-5 years if you cut back today to 'optimize' performance?" The reason we receive a reasonable salary plus health benefits plus 401K and five weeks of paid time off is because it is our job to know what will happen in the future. Yes. It is OUR job. Have you ever used Google Analytics to produce a five year forecast of where your business is likely to head if you have to cut back on paid search spend by 30%? Or Adobe/Omniture? Or IBM/Coremetrics? 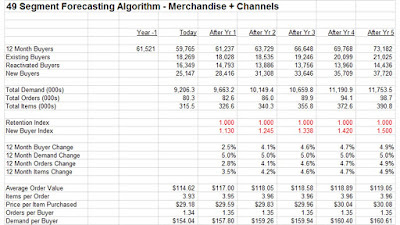 Do you use "R" to produce a five year forecast based on paid search spend changes? The forecasting discipline has been utterly abandoned in our world of "digital" analytics. 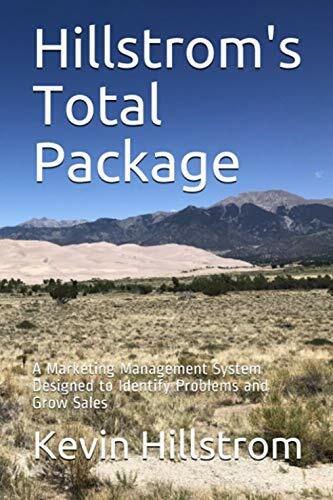 So let's spend some time talking about why it is critical to forecast where your business is headed, given your merchandising and marketing tactics, ok? In other words, if you don't have a five year forecast for your business, you don't have enough analytics/marketing knowledge. A week ago you read about the business simulation run at the VT/NH event on March 30. Remember the winning outcome? How about we try something? I have a new version of the simulation ... one that is more customer-centric ... one less product/staffing centric. 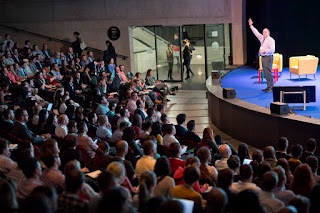 I plan on presenting the new version in London at the DCA Annual Summit on June 15 (click here). If you would like to have your staff try the simulation, I will run the simulation for the FIRST COMPANY who responds to this blog post. Three Hour Simulation Run with up to 20 members/teams. Two Hour Afternoon Session on Customer Acquisition Tactics and Merchandise Forensics. Three Hours Discussing Your Current Business Challenges. Cost = $4,000 plus travel expenses. If interested (and if you are interested, hurry the heck up because only the FIRST COMPANY TO RESPOND gets this opportunity at this low price), email me right now (kevinh@minethatdata.com). Which Image Was Clicked On The Most This Week? You already know the answer, don't you? I #measure how readers interact with images, and for good reason ... I get to see what readers are interested in. 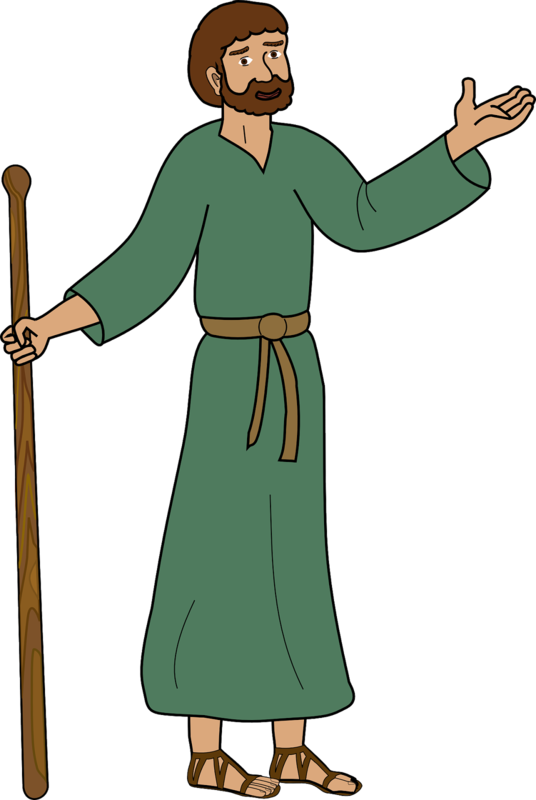 Now, if I wanted to #optimize my blog in order to generate the most #engagement, I'd stuff images of the prophet on every post, wouldn't I? I wouldn't focus on #content that actually helped you run a more profitable business. And before long, I'd be out of business ... fully optimized of course, but out of business. Might there be a comparable story surrounding your brand? When there are multiple stores in a market, the case for closing an under-performing store increases. Why? Well, when there are five stores in a market and you close one store, retail sales are less likely to simply disappear. It's much more common for half of the sales to reallocate to existing stores, while some of the sales reallocate to the online channel. The Market-Level Profit-And-Loss Statement looks something like this. The $800,000 store is generating $300,000 of true incremental net sales value - and is in reality a wildly unprofitable store. So again, this prompts discussions at an Executive Level. Can we defend generating $300,000 of incremental sales that lose $84,000 profit? In our modern world, there are more experts who would defend $300,000 of sales that lose $84,000 then there are financial folks who are there to defend company profitability. In most cases, Executives / Directors / Managers earn annual bonuses dependent upon net sales increases and earnings before taxes increases. There is literally an equation that helps the Executive make this decision. Forecasting becomes critically important. 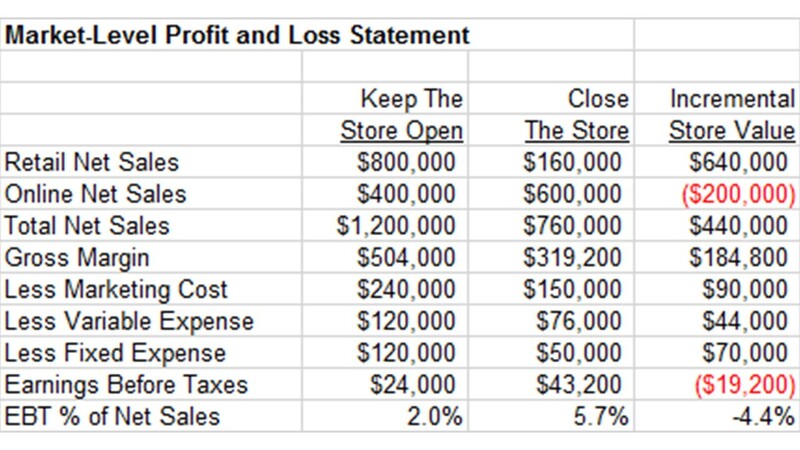 If we forecast retail sales to continue to decline, then the exercise becomes irrelevant - the store needs to be closed. 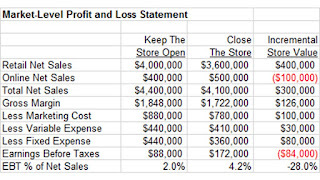 Smart retailers have market-level profit-and-loss statements for every market. 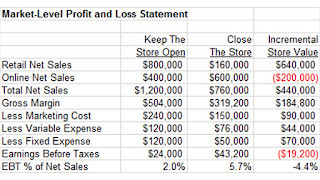 They hire analytics gurus to forecast what will happen in the future, and the analytics gurus figure out what is likely to happen in the future if a store is closed. Again, forecasting becomes critically important. Without credible forecasts, there's just a lot of shouting and thought leadership. 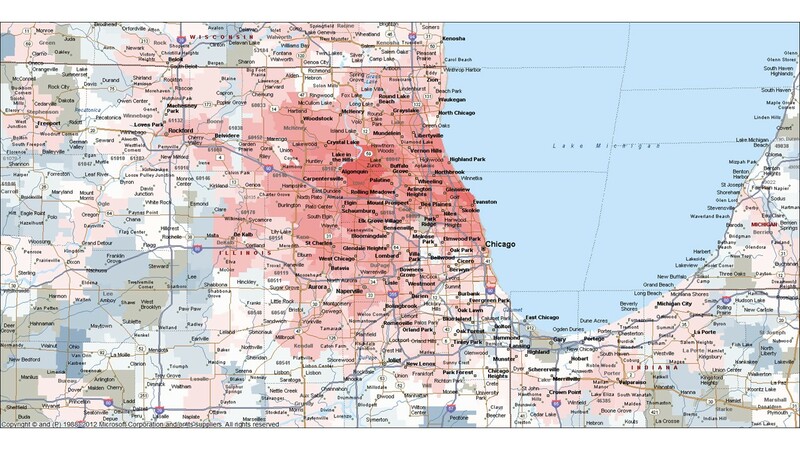 Contact me (kevinh@minethatdata.com) for your own forecasting solution.